The second annual Screen on the Green movie series in Goodale Park begins this Friday evening with “The Fantastic Mr. Fox.” Presented by the Short North Civic Association, this will be the first of three outdoor movie nights at the softball diamond in the park’s southwest corner. All movies begin at sundown and will be preceded by a half hour of classic cartoons. Refreshments from the Clintonville Community Market, Jeni’s Splendid Ice Creams, Mikey’s Late Night Slice, and Rad Dogveg will be available for sale. An Oscar nominee for Best Animated Feature, “The Fantastic Mr. Fox” is Wes Anderson’s stop-motion adaptation of Roald Dahl children’s novel. It explores an aging fox that returns to the criminal life of his youth and features the vocal talents of George Clooney, Meryl Streep, Bill Murray, Owen Wilson, Willem Dafoe, and Jason Schwartzman. 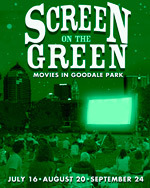 Screen on the Green will show “Monty Python and the Holy Grail” on August 20 and “Best in Show” on September 24. The movies are free and open to the public. Attendees are encouraged to bring blankets, lawn chairs, and flashlights. There are no rain dates. Special thanks to Melissa Starker with the Gateway Film Center and to the Short North Foundation for helping to sponsor these events. Visit shortnorthcivic.org and Facebook.com/shortnorthcivic for more information. Alexandra Kelley sits on the board of the Short North Civic Association and is a featured writer for Columbus Underground. Visit alexandra477.com for more information.